When the current owner of this home told me plainly, “This is my private oasis in the city,” I was intrigued. This well positioned home sits in a whisper quiet spot on leafy Lansbury Parade, Ashgrove. Designed for entertaining, it features a large open plan living area and deck overlooking the park, yard and in-ground pool. Providing absolute privacy and a sought-after Ashgrove lifestyle, this is an unmissable chance to secure a truly exceptional residence. 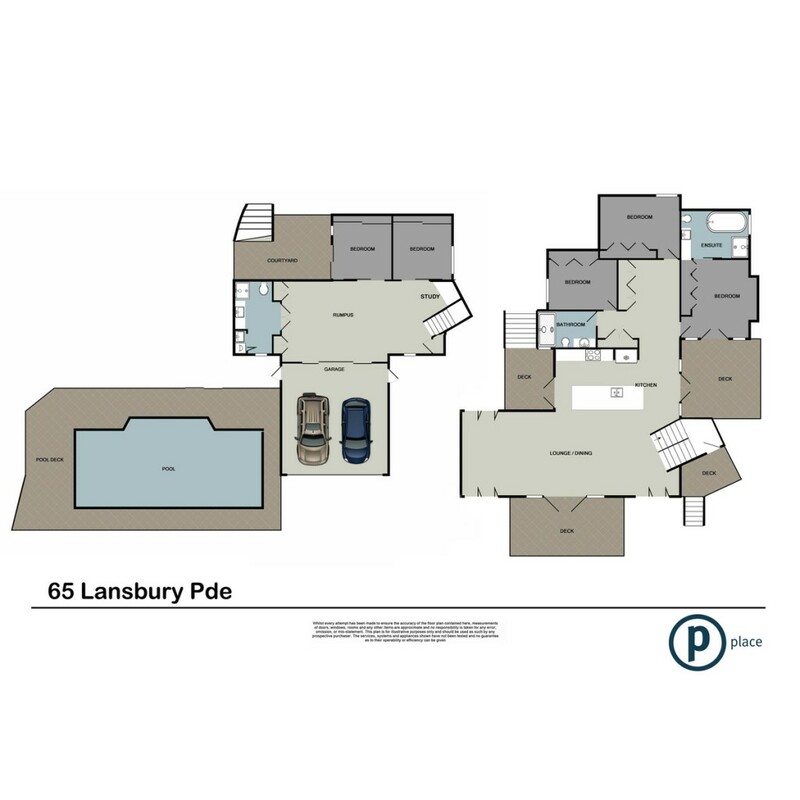 In a street filled with beautifully restored homes, the kind that Ashgrove is renowned for, 65 Lansbury Parade offers something unique. Casual, relaxed and yet exceedingly stylish, it's difficult to categorise the class of this residence. As an individual rarely lost for words, I found it almost impossible to translate the calibre of soul embracing every corner of this home. From the street a black facade contrasts with an array of dark timber and provides the perfect backdrop for the vibrant green hugging the perimeter of the home. Enter the property through the landscaped gardens and ascend the stairs to the upper level where this fantastic property unveils itself. It's flawless mix of black and natural timber finishes blend with hints of corrugated iron, copper and steel to infuse comfortable Australian living with a twist of Californian class. The floor plan embodies the ideal layout of essential quiet hideaways with a balanced combination of intimate spaces for personal time and larger, open living areas perfect for bringing an entire family together. The upper level features multiple balconies that catch the soft morning sun and bathe the home in afternoon light, all while capturing every breath of refreshing breeze available. And with so much of the home openable on demand, it stays naturally comfortable and results in the fully ducted air conditioning hardly ever being required. Streamlined and practical, the gourmet kitchen offers an extra wide bench, perfect for entertaining or preparing a meal. It is easy to create a culinary feast here with 180 degree vistas of your surrounds and premium inclusions such as stainless steel French door refrigerator, 900mm freestanding oven, two Vintec wine fridge, black soft close cabinetry and feature matt black tapware. Every appointment fits seamlessly into the bigger picture of the home. The master bedroom is reminiscent of a luxury hotel suite, complete with a morning deck awash with natural light as the sun rises. An innovative two-tone wardrobe leads you to an expansive ensuite where a striking palette of black and white tiles and matt black tapware provide a truly modern edge. Relax in the free-standing tub, or step under the rainfall head in the inviting open shower space. Two more spacious bedrooms are also on this level, both with a plenty of storage and just steps from the main bathroom, ideal for keeping the young ones close by. Downstairs is perfect for teenagers or guests, inclusive of two bedrooms with oversized built-in robes, huge rumpus/lounge room with study nook and a full bathroom with laundry. From here, you can move straight from the couch to the sparkling pool, carefree and comfortable. It's truly a private oasis. Located within 5km of the Brisbane CBD, you'll find Marist College, Mt St Michaels, Kelvin Grove State College, QUT, Ashgrove State School and St. Finbarrs Primary, all on your doorstep. Add this to the extensive parklands, the village atmosphere of Ashgrove, it's cafes and shopping precinct, and this property can offer your family an enviable lifestyle. When words aren't enough, all I can say is that this is a home you need to experience for yourself.